As mentioned, this release also included a series of improvements of existing features, some of which have already been exposed for a few weeks but we wanted to use this release update to ensure you aware of these. 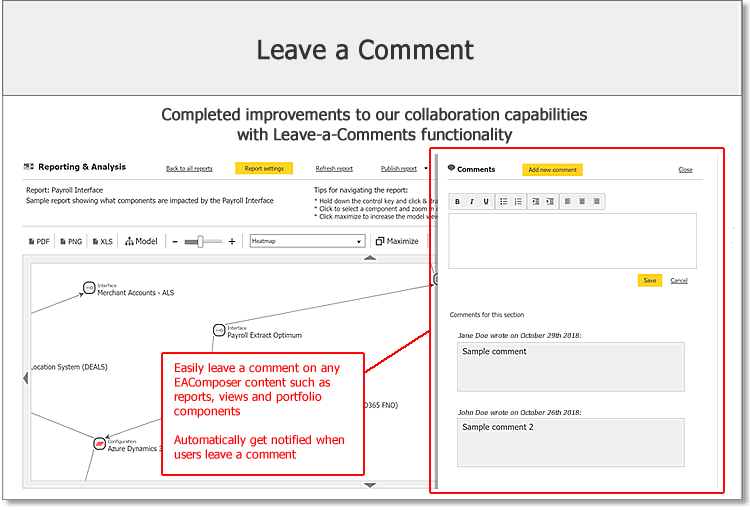 - Leave-a-Comment: A new Comments feature was added, which can be accessed from the top-right of your screen. Here you can access all comments related to a section, leave new comments and read all existing comments. Users also receive email notifications on any new comments. - Visual Settings for Reports & Views: We added more options for the visual styling of reports and diagrams. You can now control many aspects of how a component will be displayed like the text color, borders, icon, display type information and more. We also added the option to display a component as a node which, especially in impact analysis & traceability reports improves, can improve readability. - Visual Explorer: This feature was added several weeks ago and was from a recent customer request. It enables you to drill into your landscape visually. Select a starting point and start drilling into your IT architecture. - Excel Export: In order to improve maintenance of data we improved our Excel export. Excel export was already partly available via our Reporting & Analysis section (by saving a report to Excel) but now, inside the Portfolio section, you can export any set of components or relationships. You will receive a download of an Excel workbook with various sheets for the different content you requested to export. Make any changes and then import the same Excel workbook work via our Excel Import feature. - Single User License: We had a few requests in the past from smaller organizations for a Single User subscription. This was added in this release, now you get started using EAComposer for as little as $99 per month! - Single Sign On: We have extended Single Sign On (via SAML2.0) to our Corporate subscriptions, before this feature was only available to our Enterprise customers. [u]- Sandbox Environment: Enterprise subscriptions now have access to a free Sandbox environment, this is separate repository that you can use for testing purposes.